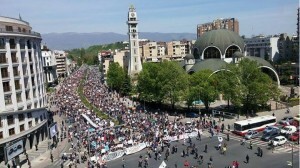 Spring has arrived in Macedonia: thousands of pupils and students protest against education policies. An interview with High School Plenum. Thousands of pupils, students and teachers marched today across the country, in a renewed challenge to governmental education policies. 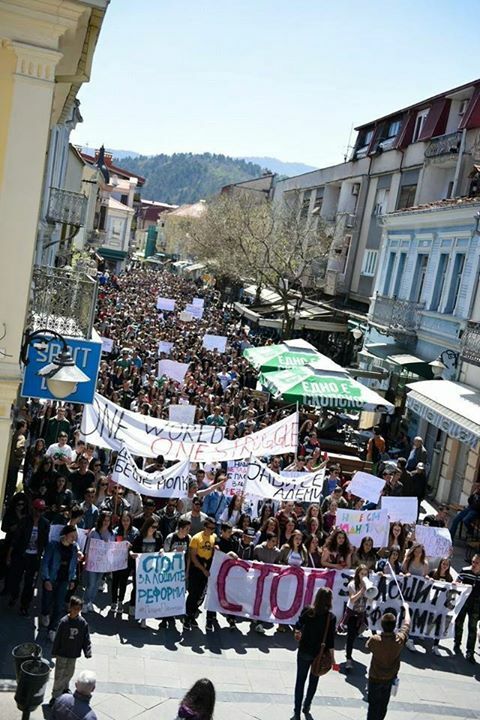 Organised by the High School Plenum, the protest comes two months after the Student Plenum declared victory against reforms in Higher Education on the 24th of February, 3 months after the students’ first march on the 17th of November. 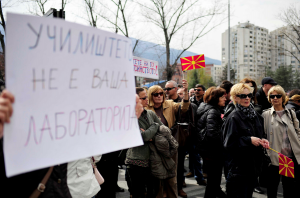 “For the first time in the history of Macedonia, but also the region, students and professors will participate directly in the process of devising a law which affects them”, the Student Plenum exclaimed. Undoubtedly a huge achievement, the success of the student movement, is hardly limited to these concessions. Aside from teaching a lesson on direct democracy, they may have cracked the government’s public image of total invincibility. Fearing what might follow, Parliament responded swiftly by adopting changes to the Police Law allowing police to use rubber bullets to disperse violent crowds. Now the High School Plenum, a separate body, is fighting their own battle. 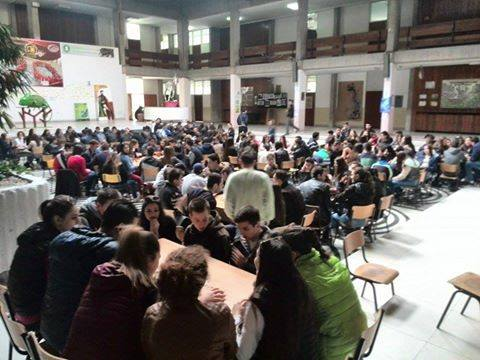 Formed at the end of January, its initial intention was to unite all the pupils across Macedonia. 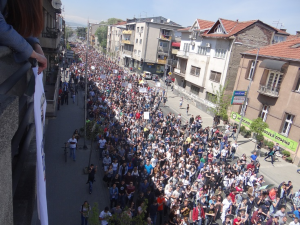 Unlike the University Students, who protested against government proposals to introduce an “external examination system” in Universities, the high school students are protesting against an existing externally controlled state-run graduation in high schools. The exam, which is taken at the end of four years of secondary education, is intended as a check on their skills and an evaluation of the teachers’ work. 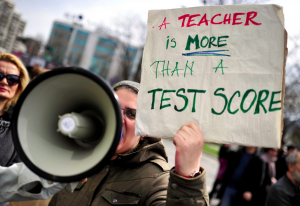 The pupils say that the tests are unfair, that they fail to represent their achievements or desires and that they are used to bully them and their teachers, since they face salary and other consequences if the scores are low. Today’s march is their third. They were joined by the Student Plenum. We asked them what was happening in the run up to today’s protest march? Zana Zivadinovic is a member of the Teachers’ Plenum, which was formed in support of the pupils’ at the end of January in order to encourage public and informed debate about the reforms in primary and secondary education. Zana Zivadinovic: “What is even scarier than the failure to accept a dialogue and a wider discussion, is the of use repressive measures by the authorities, such as for instance the labelling of illegitimate unions of students, threats for expulsions and disciplinary measures, blackmailing parents, party-political pressures. They went so far as to circulate posters with humiliating and vulgar contents, which labelled the pupils as “agents of Soros” – a strategy frequently used by the governing party to discredit their opponents. This has only exacerbated the revolt and resulted in the boycotts. Nonetheless, the students demonstrated maturity, through their slogans for unity, solidarity and absence of fear in vocalising their attitudes. They have been successful at challenging the continuous pressures, blackmails and threats whilst remaining united in their fight for a better education. They emphasise that they “are not scared of studying but are thirsty for knowledge”. The fact that some of the best Gymnasiums in the country have joined the protests is only a confirmation of this. Their unity certainly makes the resistance stronger. Aside from the Student Plenum, today’s protests were also joined by the Teachers’ Plenum. What is their respective relationship with the High School Plenum? H.S.P. : The relationship between the different Plenums is on the level of support. We have officially invited our friends from the other Plenums to support us by joining us on the streets. As high school students, we are exceptionally happy that we are not alone in this fight, but have the support of our future colleagues and professors, our teachers, parents and fellow citizens who agree that it is time to say “No” to the bad reforms in education. Z.Z. : The relationship between the Plenums is clear: education is a system, which consists of different stages, each inseparably bound to the previous one. As the pupils have said in their call for solidarity: “there cannot be a good quality higher education without a good quality secondary education”. The Teachers’ Plenum fully supports their demands. One of the most burning problems, which led the teachers to protest at the beginning of the second school term, was exactly the model of external examination, its complete counter-productivity, didactic flaws and malformed objectives. On the other hand, these are our pupils. It is our duty as teachers to protect and support them when they show initiatives regarding decisions which affect them. Nonetheless, we mustn’t forget that a democratic society requires the inclusion of all and the respect of everybody’s opinion. These young people are also guaranteed this right by the Convention on the Rights of Children, whose signatory is also Macedonia. Organising through Plenums was originally started by the Student Plenum. To what extent has the horizontal decision making process been maintained by the High School Plenum? H.S.P. : The High School Plenum functions with a total horizontality, and there is no hierarchy. Each High-School has its own internal plenum which decides on the stance of that school. Then, their opinions are voiced on the general plenum where decisions are made by way of voting. Membership in the Plenum is open to anyone who wants to make a change or has an idea about the possible improvements in the secondary education. Our capacity to appeal to the masses proves that we are the true voice of the high school students, and also confirms our legitimacy. Z.Z. : It is exactly the horizontality of the Plenum which has made it resistant to the attacks, but it has also motivated all those involved to be proactive. The Teachers’ Plenum has publicly thanked the Students for promoting horizontality, which creates the space for everyone to argue their case, but in the end the official decisions are reached by the majority. The students have carved this path for us, and it is easier to follow along this way, especially because their battle demonstrated the strengths of the model. Compared to the students, it is more difficult for us to organise general plenums, because the teachers are dispersed across the country. 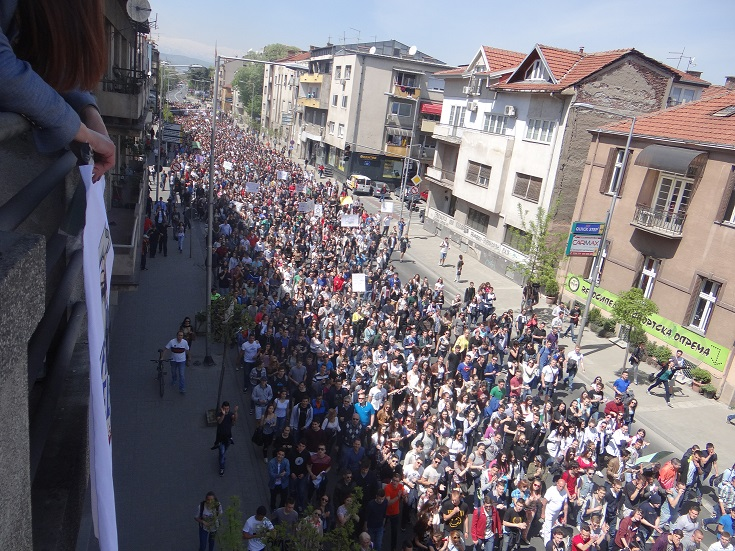 So far, the internal plenums have functioned very well, especially those in Kumanovo. Of course, the Internet is crucial for maintaining the communication. Which are the biggest risks you have faced so far, or which you expect to fact in the future? H.S.P. : Our entire struggle can be called a risk. We have never before been this scared about our future, we were never put to such a test before. But we have been forced into this situation. How far ahead our struggle and boycott will continue depends on the Minister of Education: Ademi. We will not give up until we win, because we can no longer accept to be treated like lab mice for the experiments of the Ministry of Education and Science. Z.Z. : Until now, the biggest risks remain on the level of verbal threats for lay offs of staff and their family members, party demands for loyalty and threats for legal action (such as for instance the one which the Teachers Plenum received from the Union which is supposed to protect us and our rights). We hope that the threats will not materialise and we hope that the announced repressive measures are just methods for intimidation. I don’t think this is working for the authorities, because each time they put pressure on members to leave the Teachers’ Plenum, we get 10 new members. All the pressures which we get are another motivation for intensifying our revolt, for the Plenums to say jointly: Enough with Silence, we have a stance, and we are not scared to fight for it ! A more general problem remains. 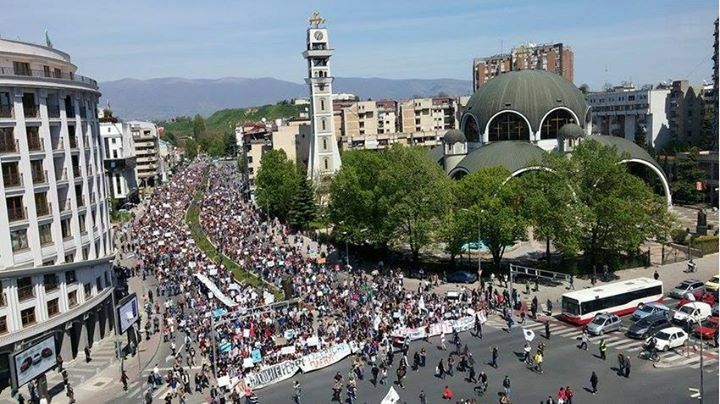 The teachers in Macedonia are in a terrible situation imposed by the new law for substitute teachers which directly waters down the effect of any future strike of workers in education. This new law was used by employers during the last teachers’ strike in order to intimidate them with at least temporary lay offs. Unfortunately the Union, which was supposed to be most affected by this decision, failed to articulate any concern against this question during their negotiations with the Ministry. By doing so they jeopardised the constitutionally guaranteed right to strike. Following in the footsteps of the Student Plenum, which declared a free university zone on the 11th of February, the High School Plenum today threatened to radicalise the protests, by forming a “Free High School Zone” by setting up a camp in the park outside of the Ministry of Education. Adela Gjorgjioska is a PhD Student based in Rome, researching the social representations of human rights and justice. Her research interests include contemporary radical politics, social representations of the Left and of the Ottoman Empire, and conflict resolution. 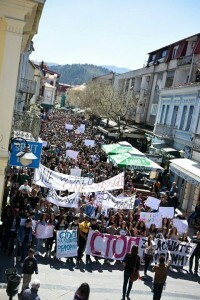 3 Responses to Spring has arrived in Macedonia: thousands of pupils and students protest against education policies. An interview with High School Plenum.